How Can I Guarantee Entry to a Marathon? Home > Ask Our Experts > How Can I Guarantee Entry to a Marathon? I am trying to arrange for myself and for others to undertake the challenge of running 5 big marathons in 2011 but I am hitting an issue with finding an organisation that will guarantee our entry to the marathons. The reason that we are doing this is to raise money for Great Ormond Street Hospital and Eleanor Nurses, following the diagnosis of our daughter with Leukemia last November. We are all keen runners and felt that this was a great opportunity to raise a considerable amount of money for charity but we need to guarantee our entries for this to work. The five marathons that we wanted to do were London, Paris, Berlin, Boston and New York. I would be grateful for any advice that you can give. The bigger the marathon, the more difficult it is to guarantee entry and you have chosen five of the most prestigious events in the world. It is exceptionally tough for one charity runner to gain entry to the London, Paris, Berlin, Boston and New York events in the same year, so for a group of charity runners it is almost impossible. Of course the causes – in this case Great Ormond Street Hospital and Eleanor Nurses – are worthy indeed and the reason for wishing to undertake such a task is both understandable and admirable. Unfortunately, many charity runners enter events for causes just as good and motives just as honourable. At the London marathon, most major charities have a set number of entry places each year, and these are allocated to runners on the basis that they will raise an agreed amount of money for the charity. To apply for one of these charity places, a runner has to contact his chosen charity directly and see if it has any places available. London organisers warn that there are usually more people interested in running for each charity than there are places available. Charities tend to select runners based on the person’s connection with the good cause and how much money they are realistically able to raise. Each of the five marathons you have targeted are major sporting events in their own right and each has its own entry rules, making it even more difficult to guarantee a block entry of charity runners in all five in 2011. For example, New York entry is guaranteed when you run for a New York Road Runners official charity. Berlin has places for those looking to raise money for one of its charity partners and, although Boston accepts a limited number of new charities each year, only organisations located in the Greater Boston area are invited to apply to the join the official charity programme. If it is important that London, Paris, Berlin, Boston and New York remain the venues for your charity runs, the best option is, where possible, to enter each race and hope one or all of you gain entry. However, if it is more important that you undertake the charity runs as a group, consider targeting lesser-known events as this will make a block entry more achievable. 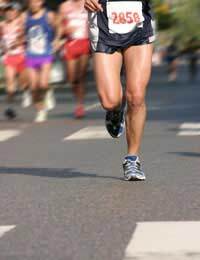 How to Stop Legs Becoming Too Muscular from Running?